Graduated from the Kikuchi College of Optometry. He aspired to be a specialist in vision care during his days in college as he studied topics such as eyeglass regulating and visual physiology. 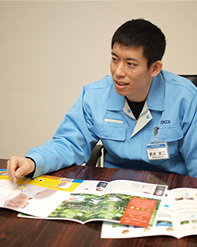 He joins Tokai Optical on the advice of his professor. While firmly believing that the development of eyeglasses is half medical care and half business, he continues to engage in research on spectacle lenses from various angles in the pursuit of vision care. Have you ever heard of a disorder called age-related macular degeneration? It is a distortion where eyesight is weakened and vision is distorted due to aging of the macula, which is a part of the retina. It is said to be the leading cause of blindness in the West and is growing rapidly in Japan, too. One reason behind this is the extended amount of time our eyes are exposed to blue light due to our looking at devices such as tablet computers and smartphones at night more than ever before. Lutein is a nutrient that is gaining attention for its properties that help prevent age-related macular degeneration. Lutein is a yellow pigment that builds up in the retina and protects the retina by absorbing blue light, which is a cause of oxidative stress in the eyes. It also has the ability to eliminate reactive oxygen that is generated by stress. To keep plenty of lutein in the retina is to protect the eyes against aging. For example, we have products that are categorized as foods for specified health use, don't we? Can spectacle lenses be used to maintain good health like ingesting food does? Does protecting your body from light lead to good health? These questions have led to the developing of lenses that reduce the depletion of lutein by cutting out light. Wearing eyeglasses is the same thing as becoming healthy by eating green and yellow vegetables. This is why having more people subconsciously preventing eye disorders has become a great source of inspiration for us in our development. We carried on our research while receiving advice from Doctor Amane Koizumi (Doctor of Medicine, Specially Appointed Professor at the National Institutes of Natural Sciences), who is an expert in the visual physiology of the retina and has been assisting us through collaborative research for some time now. The first design principle that we decided on was the making of lenses that are close to completely clear. Most people wear masks as a preventive measure against illnesses that are easy to identify such as colds, but eye disorders usually do not have symptoms such as pain so sudden blindness can occur with some people. On top of that, eye disorders cannot be reversed with regret and efforts for improvement. That is why prevention is important along with eyeglasses that can be worn in any situation without hesitation by anyone, regardless of age or gender. People do not keep up with eating health foods unless they taste delicious and are easy to ingest. Making lenses that are close to completely clear. This is to identify the wave lengths of light that are the most harmful to the eyes and to create lenses that can selectively cut them out. We have read various documents, studied the relationship between oxidative stress in the eyes and light, evaluated degrees of lutein depletion, and have done experimental production of lenses that cut out various wave lengths. Upon examining the color tones, our conclusion was lenses that cut out 400 to 420 nm wave lengths. High-performance lenses developed with Tokai Optical’s grand concept of health and prevention. This is what led to the development of Lutina lenses, which were released in December 2014. They signify the birth of eye care design, which prevents lutein damage from light and keeps the eyes healthy by protecting the retina. As an optional extra, Lutina lenses can be coated on their back surfaces with P-UV to significantly cut out ultraviolet radiation that enters the eyes from various directions. ESC (Eternal Skin Coat) can also be used to protect the skin not only from ultraviolet radiation, but from near-infrared rays as well, and thus maintain beautiful skin by preventing wrinkles and sagging around eyes. Applicable also with colored lenses. We would like for you to prevent eye disorders with your own customized everyday eyeglasses that fit you well. This is our hope for you. Lutina is the first step in Tokai Optical’s eye care design creating new standards of spectacle lenses. We plan to sequentially release various types of Lutina lenses in the future so please be sure to give one a try and see how you like it.